Bruce Jenner doesn't want to hurt family with his transition. Putting his family first! In a new teaser from Bruce Jenner's buzzed-about interview with Diane Sawyer, the former Olympian, 65, opened up about his famous family. "Those are the only ones I'm concerned with," Jenner said of his kids. "I can't let myself hurt them." Jenner is the biological father of six children and the stepfather of Kourtney, Kim, Khloe, and Rob Kardashian. As determined as he is to make sure his children are okay with his decisions, Jenner is also focused on being true to himself. "My whole life has been getting me ready for this," he said in the clip. 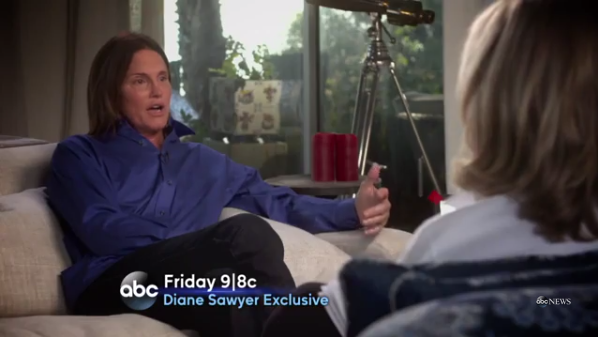 Jenner is expected to discuss his transition from male to female during the exclusive interview. Bruce Jenner: The Interview is set to air on Friday, April 24, at 9 p.m. ET. TOO DAMNED LATE BRUCILLA!.....Them kids except for Kyle are way gone.....SMH! Sorry Brucilla, but Kris damaged that whole family (and possibly you) beyond repair. Please, allayall, go away to Cheyenne Mountain.